Why do I love Oklahoma? People who aren't from here ask me this question on a regular basis. I understand why people are curious because there are so many things about my beliefs that do not align with a state that makes national headlines for things that are regularly embarrassing. I do not support our Governor, I disagree with most things that the State Congress does, and hailing from a state that regularly provides the world with meme fodder has its disadvantages. The things that garner us national attention are usually cringe-worthy — except for Sweet Brown, you keep doing your thing, girl. Aside from the fact that Oklahoma is regularly a national embarrassment, it is also home. 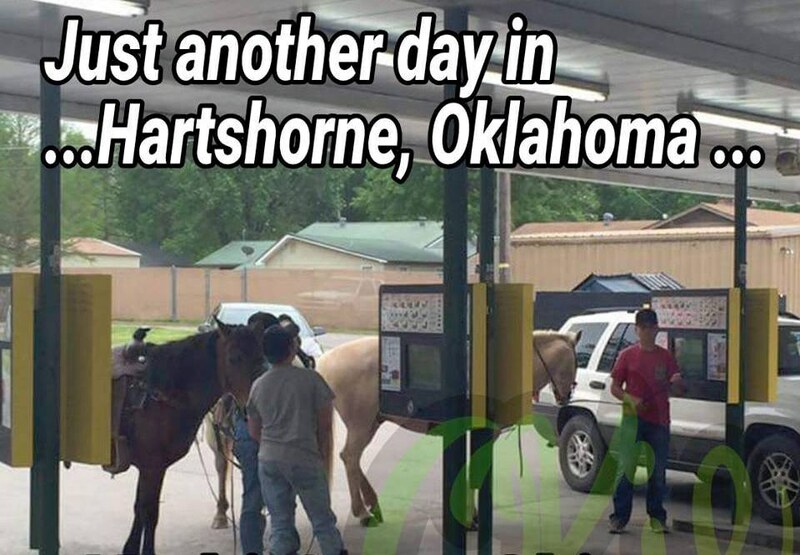 I hail from a small town in Southeast Oklahoma — Hartshorne — that no one has ever heard of; we have two traffic lights and one is usually broken, people regularly ride their horses and/or ATVs into town, and, yes, we do have a guy who hitches a trailer to his lawn tractor and uses it to haul his groceries home. The town even reenacts a bank robbery as part of our Independence Day celebration, they've done it since my mother was a kid. I grew up watching it every year with my cousins and now one of them is one of the "outlaws" who rob the bank. It is traditions like these among other things that makes Oklahoma such a great place to live. Oklahoma will always hold a special place in my heart and it will always be OklaHOMEa. 1. People are friendlier in Oklahoma than in other parts of the country, or even the world. 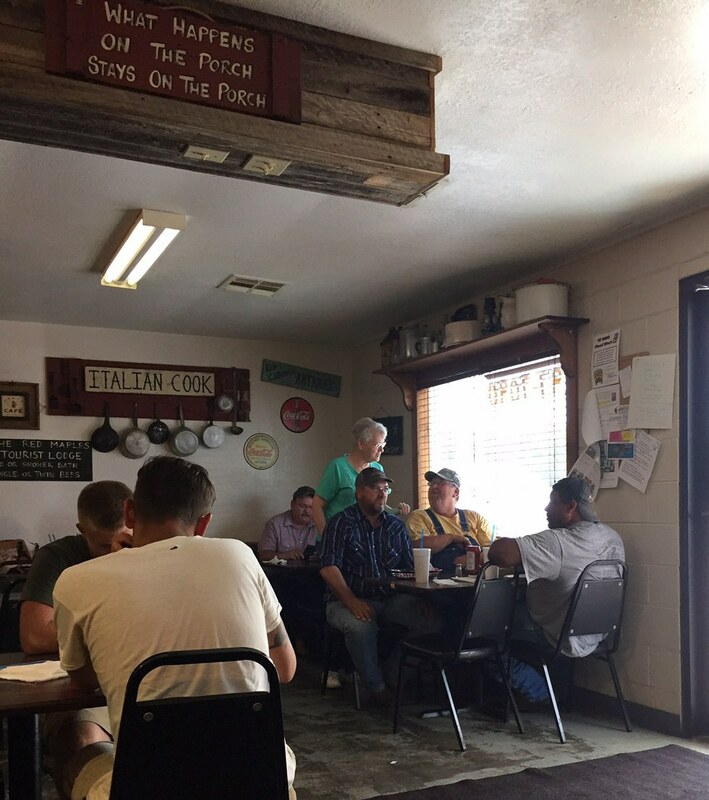 This is a photo of my NeeNee (grandmother) making her rounds at the local café. She makes it a point to say hello to and/or hug everyone she knows, which is usually most of the restaurant. I've been told by several people who aren't from Oklahoma that they find our friendliness weird and sometimes unnerving. We smile at strangers on the street and wave each other on at four-way stops. Apparently this is just plain strange to anyone who isn't an Oklahoma native, but its part of the reason I love this state. 2. The generosity and sense of community. If you ask anyone from outside of our state what they know about Oklahoma, you'll likely hear "tornadoes." We are dead center in the middle of tornado alley and we know what a storm can do, but every time our community is ravaged by mother nature we come together to clean-up and rebuild. Almost everyone I know did something to help after the May 20, 2013 tornado that destroyed a big part of Moore, Oklahoma. It may have been a small gesture such as donating a few cases of bottled water or as big as throwing a benefit concert like Toby Keith. 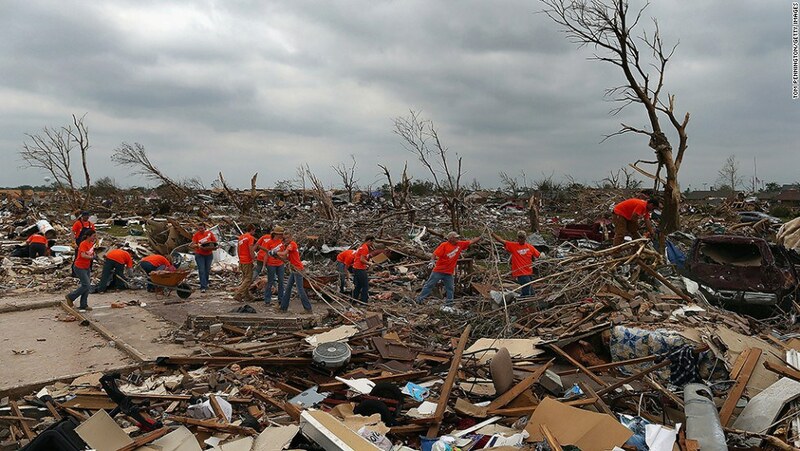 It doesn't matter what it is, big or small, Oklahomans help in anyway that we can. Our state meal (yes we have a state meal) consists of chicken fried steak, mashed potatoes and gravy, corn, fried okra, pecan pie, sweet tea, and the list goes on. 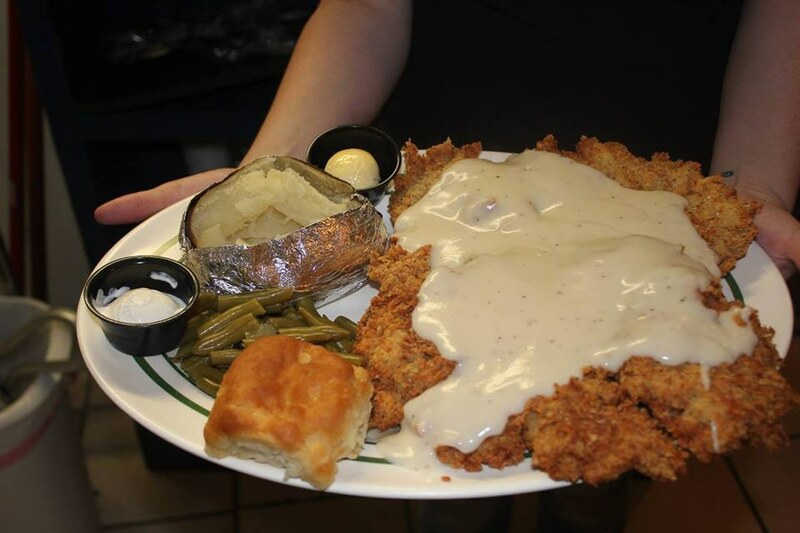 People who aren't from here get really confused when you say "chicken fried steak." When I lived in Michigan people called us strange for having black-eyed peas for New Years dinner and servers would always bring out unsweet tea and sugar packets when we ordered sweet tea. If you don't mind the fat content and cholesterol, our food can't be beat. Oh, and Dr Pepper, because Dr Pepper. In my opinion Norman is the greatest city in the state. Move over OKC and Tulsa, Norman is comin' for ya. Norman is home to the University of Oklahoma and as a college town it has a lot to offer. Norman is the city of festivals where there is always something going on. Norman offers a wide variety of activities for a wide variety of interests. 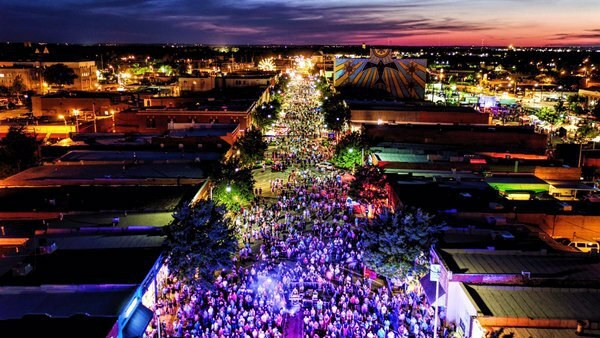 Norman has the Medieval Fair, Norman Music Festival, Jazz in June, the Summer Breeze Concert Series, and the second Friday of the month Art Walk on Main Street. In addition to the festivals and live music there is also a multitude of local bars and restaurants that are bound to strike your interest. 5. Local and regional music. Another thing that I love about Oklahoma is the local and regional music scene. Many famous musicians hail from Oklahoma and many still call the state home; Garth Brooks, Reba McEntire, Blake Shelton, Carrie Underwood, Vince Gill, Toby Keith, and the list goes on and on. Oklahoma has also brought us bands such as The Flaming Lips, The All-American Rejects, Kings of Leon, and Hanson. Aside from the more well known musicians listed above, Oklahoma is home to a fantastic lesser known sub-genre of country known as Red Dirt. The Turnpike Troubadours, Stoney LaRue, No Justice, Cross Canadian Ragweed, and The Damn Quails are just a few names that come to mind when I think of Oklahoma music. Red Dirt and Oklahoma country aren't all that the state has to offer as there is also a wide variety of genres represented throughout Oklahoma. 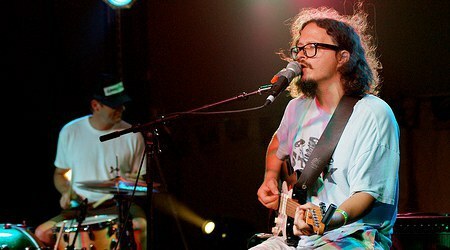 Pictured above is Hosty Duo, if you are interested in learning more about regional music I would suggest checking Hosty out - you can usually find him at The Deli in Norman most Sundays.